The cuisine of Bulgaria is diverse, combining Slavic tradition with the neighboring Balkan dishes. 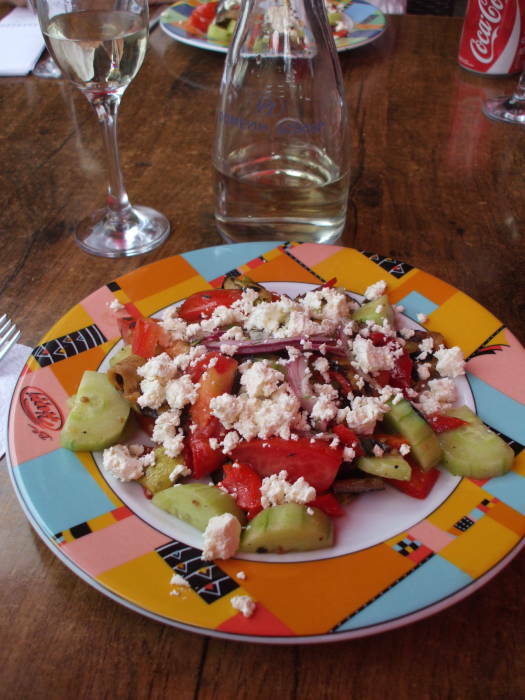 Шопска салата or shopska salata is the traditional Bulgarian salad. 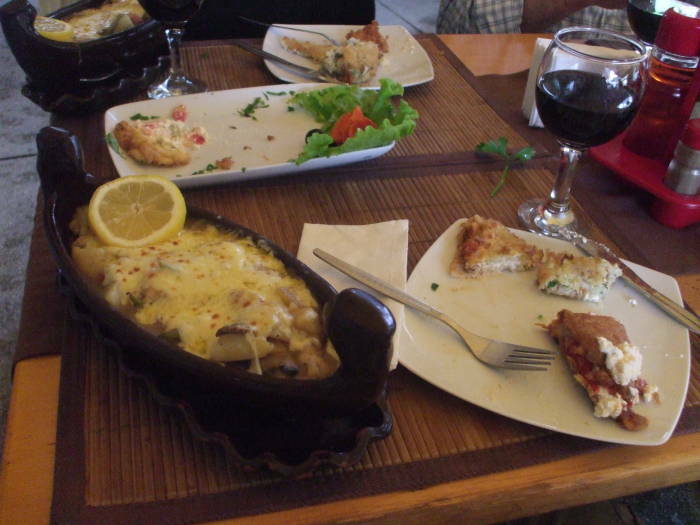 Shopska is pretty much a requirement for a Bulgarian meal. 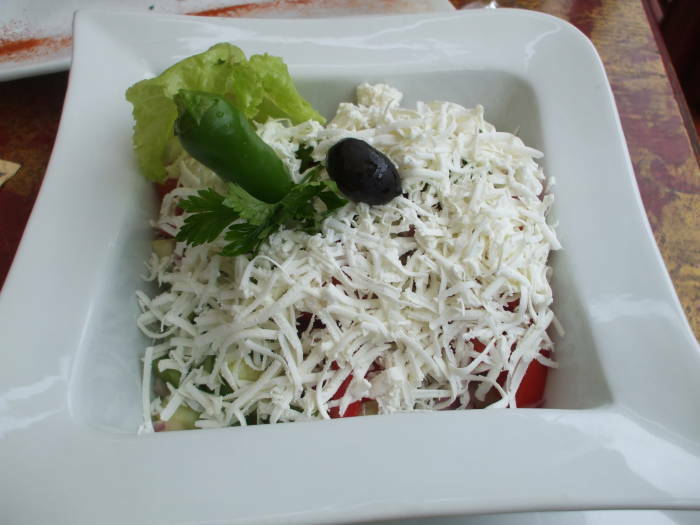 Shopska is made from tomatoes, cucumbers, onions, peppers, the white brine Bulgarian cheese сирине or sirene, and parsley. The restaurant will bring you olive oil and possibly some vinegar for dressing. Сирине or sirene is a crumbly cheese made from goat's milk, cow's milk, sheep's milk, or a combination. It is matured in a brine solution in an air-tight or semi-air-tight container, somewhat similar to the production of Greek feta but noticeably different in taste. Here we are having shopska and a Bulgarian white wine at a sidewalk cafe in Sofia. Shopska salata has a formal political background from the mid-20th Century. It was one of five or six recipes defined by the Bulgarian state in the late 1950s and intended to impress foreign visitors. Балкантуист or Balkanturist, the state organ of tourism, commissioned regional salad recipes associated with ethnographical regions. These included the Dobrujan, Macedonian, Thracian, and others. 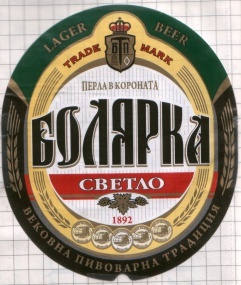 Only the Shopska, from the шопи or Shopi region where Bulgaria, Serbia, and Macedonia meet, caught on with the visitors and the locals. Ракиа or rakia is the result of distilling fermented fruit juice. 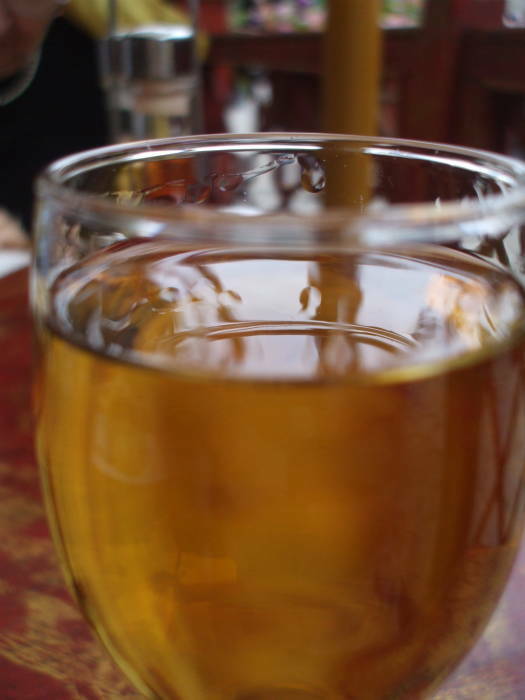 There are many varieties of rakia, produced from the many different types of fruit grown in Bulgaria. More common rakia varieties are produced from plums, apricots (I believe this is what we see here), and grapes. Less commonly, apples, pears, peaches, cherries, blackberries, and figs may be used. Most commercial rakia is about 40% ABV, but home-brewed-and-distilled versions can be from 50% up to 80%. 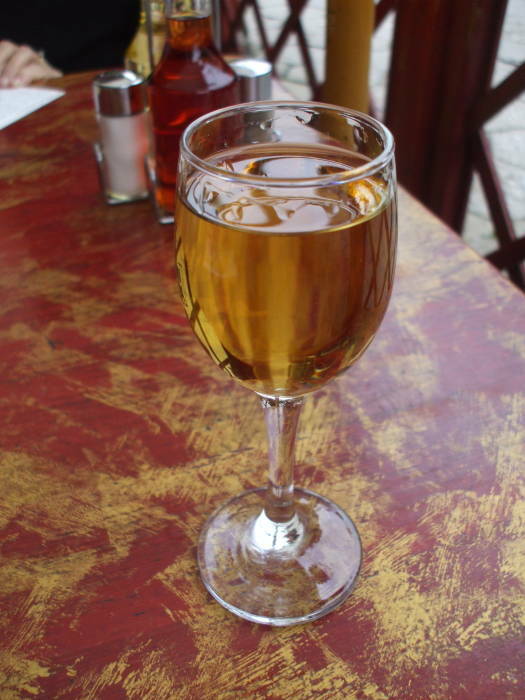 Rakia is the national drink of the region. Not to say that they don't produce and drink plenty of wine, beer, and other beverages, but rakia is the distinctively local one. The name obviously comes from the Turkish rakı, whose name in turn comes from the Arabic ʕaraq, meaning condensation. That's appropriate, as al-kohol is among the "English" words that are originally Arabic. Anyway, the name ʕaraq / rakı / Ракиа can refer to this being the result of the final stage of distillation, or to it being more condensed than wine, which is the typical drink in a mehane or Bulgarian/Turkish nightclub. It is sometimes called ичкия or ichkia in Bulgaria. Шопска салата и ракиа often serves as the starter or appetizer of a meal, or it might serve as a light meal on its own. A винарната or vinarnata is, literally, a wine bar. They also serve hearty meals. These pictures are from Щастливеца or Shtastlivetsa, in Veliko Tarnovo. 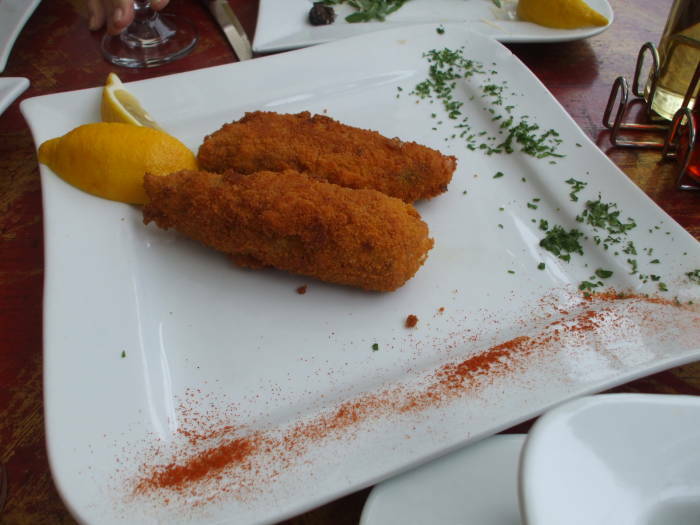 These are peppers stuffed with cirene and fried. 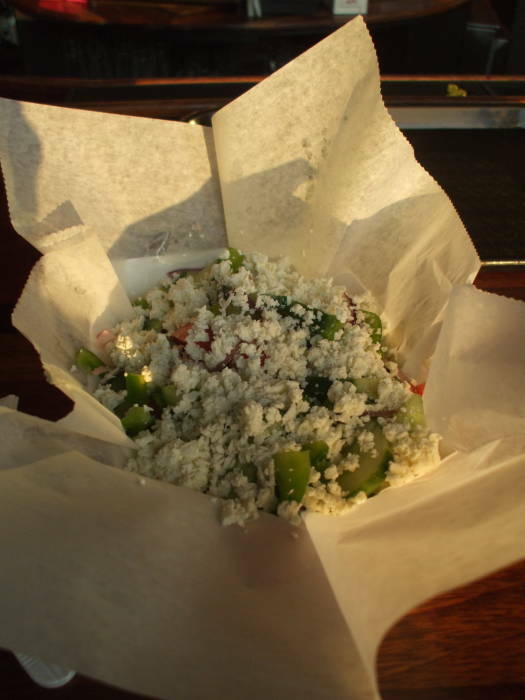 Here is Shtastlivetsa's shopska salata. 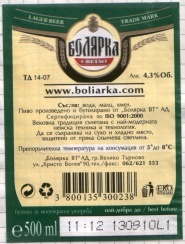 Another especially good vinarnata in Veliko Tarnovo was Механа Балкан or Mehana Balkan. The word mehana comes from the Ottoman Empire's control of this area. Meyhane is used in modern Turkish, but it comes from the Persian term for a place where people drink wine and eat meze or small dishes. Bulgaria produces a great deal of wine, as the local grape growing and wine production tradition go back to the time of the Thracians. A number of local breweries also produce beer. 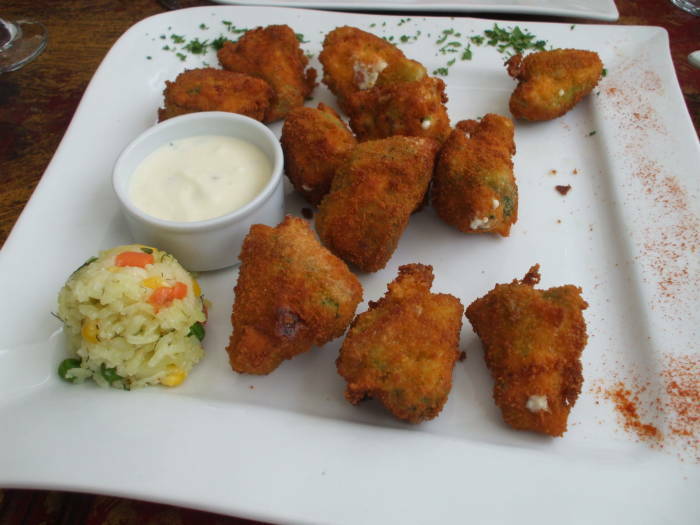 Can you find Bulgarian cuisine in the United States? I only know of two places. One is the Bucharest Grill and the adjacent Park Bar in Detroit, Michigan. At left here you see their version of shopska. You can take away food from the grill, or you can sit at the bar and order from the grill's menu. 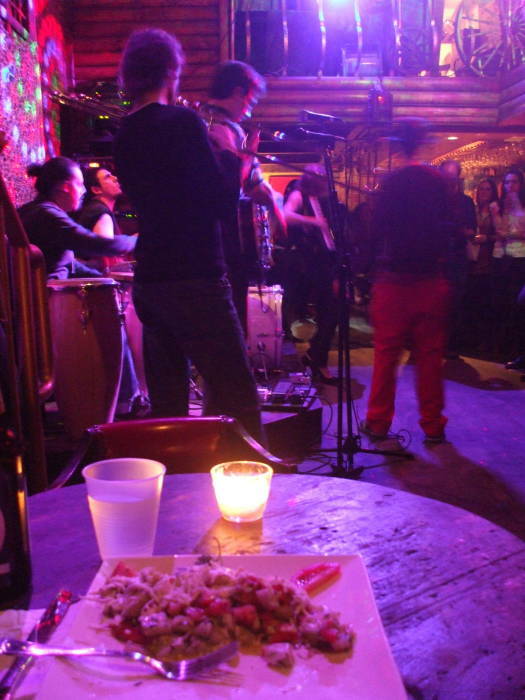 The other is the Mehanata Bulgarian bar on the Lower East Side in New York. It is much more of the full Bulgarian mehana experience! They have great live music every week. Mehanata is only open on Thursdays, Fridays and Saturdays, opening at 9 PM. 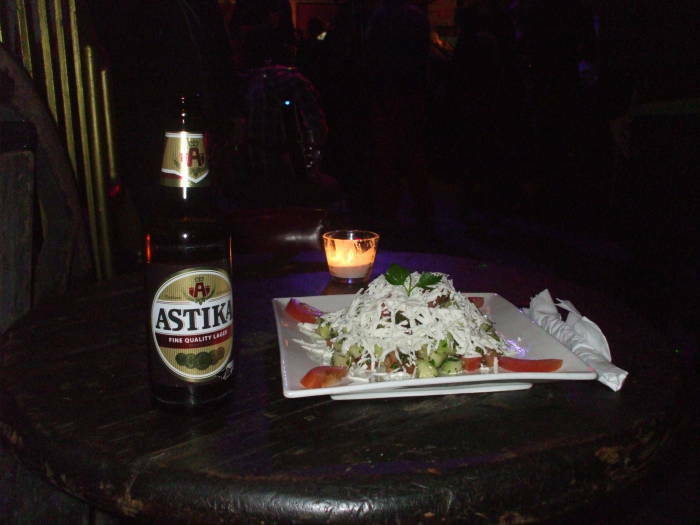 Here I am having their shopska and an Astika Bulgarian beer as the band warms up.